The Scientific goals of the telescope include observing the Sun with very high spatial and spectral resolution in the wavelength range from 0.3 to 2.5 micron; dectecting small-scale structures and fine details in the evolution of the solar mangetic fields and their coupling to the plasma; investigating energy transfer, storage and release in the solar atmosphere, such as coronal heating, the triggering of a solar eruption, and other key questions related to solar activities. 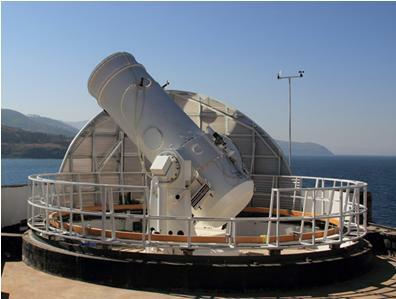 Now, as the primary optical and near infrared solar telescope used by the Chinese solar reasearch community, NVST is required to undertake more goals related to science and technology, including necessary experiments for key technology of developing next generation solar telescopes. NVST is designed to be a vacuum telescope in order to reduce turblence in the sytem. The right figure displays the optical layout. An optical window (W1) with a diameter of 1.2 meters is placed on the top of the vacuum tube to keep the air pressure inside the tube lower than 70 Pa. The optical system after W1 is a modified Gregorian system with an effective focal length of 45 m. The primary mirror is a parabolic imaging mirror with a clear aperture of 985 mm. There is a 3 arc min field diaphragm at the primary focus (F1) to prevent extra energy from entering the system. Unwanted light is reflected from the system through another vacuum window (W5) on the side of the vacuum tube.The secondary mirror (M2) converges light to an F/9 beam and focuses the light beam at the secondary focus (F2) where the calibration unit for the polarization is installed. M4 is a small flat mirror that reflects light toward the horizontal direction. As the third imaging mirror, M3 convergens light to the third focus (F3), after which there are three flat reflectors (M5-M7). The mounting system of NVST is an alt-azimuth structure. The telescope should rotate on the altitude axis and the azimuth axis against the earth rotation and tracking the Sun. The alt-azimuth mounting means stabilization and small wind resistance as well as the observation blind zone and the non uniform image rotation.